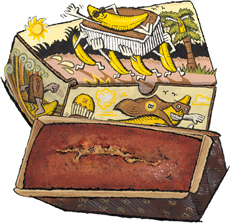 Banana Bread Gift Box for sale. Buy online at Zingerman's Mail Order. Gourmet Gifts. Food Gifts. Like our hugely popular sour cream coffee cake and magic brownies, banana bread instantly conjures up nostalgia for home baking. The thing is, this loaf tastes better than what mom used to make (no offense intended, moms, it's just hard to beat our Bakehouse). There are no nuts in our banana bread, just the classic charms: organic flour, cane sugar, real butter and fresh eggs, a touch of Madagascar vanilla and two freshly peeled bananas per loaf. Wrapped in tissue, each loaf comes packed in its own colorfully illustrated box. Wanna mix it up? Try our same classic banana bread jazzed up with chunks of chocolate, or topped with a sweet and salty pecan praline.